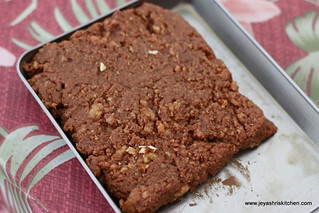 I have already posted Kalakand recipe , which is a bit elaborate one. 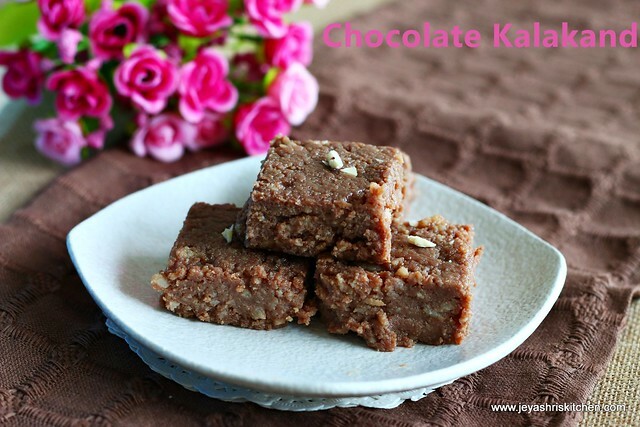 If you want to try an easy and delicious Sweet for this Diwali 2014, then here goes this Chocolate kalakand. I tried this with store bought paneer. I was in a dilemma of whether to use store bought paneer or to make paneer at home. During a casual chat with Raks she was telling that store bought paneer too came out well. 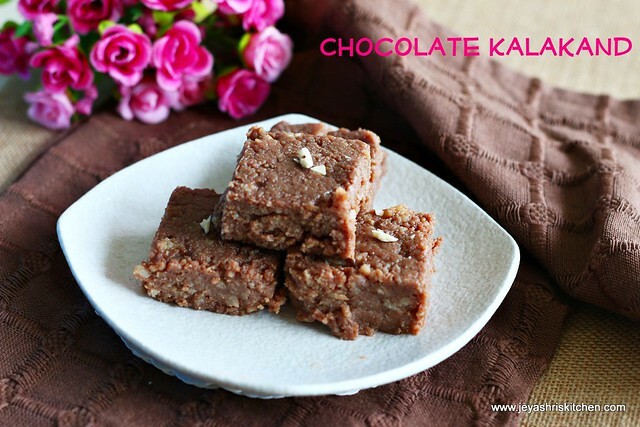 So i decided to stick on to the store bought paneer for this chocolate kalakand recipe. 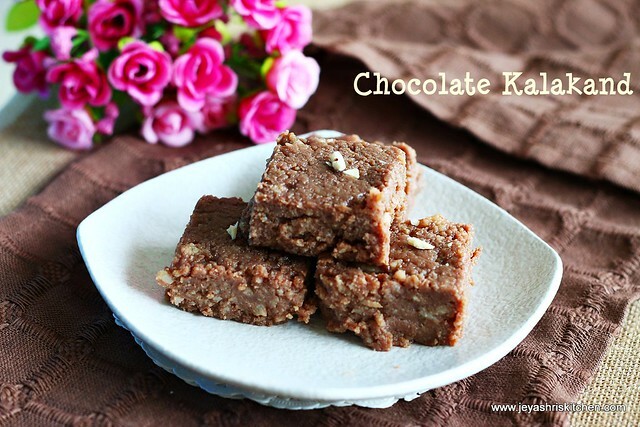 I am very sure your kids will love this chocolate kalakand for sure. 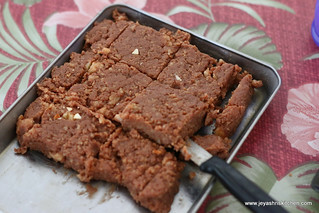 Varun, who never eats sweets, after me insisting him to try this taste this kalakand, had a bite and hugged me and told"amma you are awesome"!! 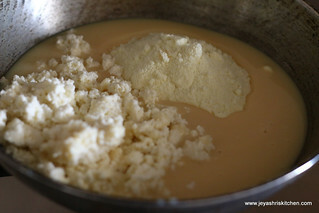 In a pan combine the paneer, milk powder and condensed milk and mix it evenly without any lumps. 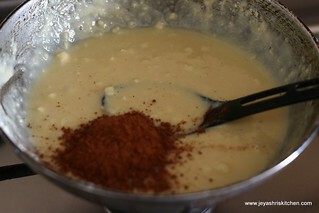 Cook the mixture in medium low flame for 10 minutes and add in the cocoa powder. Initially when i made it i don't know how much time it will take, so i added cocoa powder after 5 minutes. 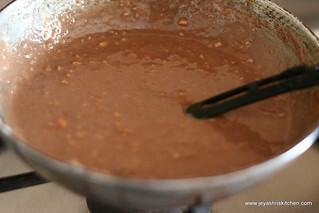 Cooking will cocoa powder for a long time will give slightly bitter taste to the kalakand. So add it towards the end . 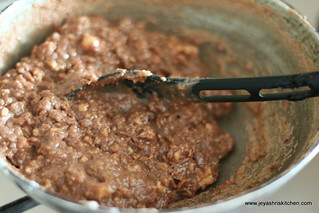 Stir well till it comes to a whole mass leaving the sides. This will come quickly. Grease a plate with butter or ghee. Transfer this to the greased plate and allow this to cool. Keep it in a refrigerator for 2 hours. Cut this into cubes with a sharp greased knife. If needed you can garnish with sliced almonds or pistachios. You can use Home made paneer too. Do not cocoa powder more than the quantity mentioned. The kalakands will not be firm as other burfis . It will be soft and chewy. 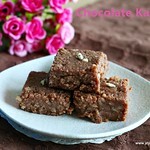 chocolate kalakand looks so good and yummy.. I had been wanting to write this as a wishlist request from me to you :) Thanks for the recipe. Can you please clarify if condensed milk is the Milkmaid that we get in stores? Or, is it something else? Delicious!! Anything chocolate is always a hit! !